"This is America, the most advanced military technologically capable country in the world, and it is just impossible to believe that they could have been that incompetent." - Michael Meacher, UK MP. On 9/11 the world's only military superpower was apparently oblivious to the location of rogue airliners in it's airspace for over an hour, and military commanders were left perplexed on how to deal with the situation of hijackers using these planes as flying bombs. This confusion resulted in fighter jets flying around aimlessly whilst the hierarchy fully assessed what was going on, and this total lack of cohesion ultimately led to the loss of nearly 3000 lives. 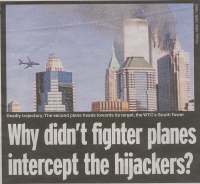 All that was required to overcome America's military might on 9/11 were 19 hijackers on 4 airliners. It's what you're expected to believe. That's a ratio of 3.5 'hot' fighter jets per hijacked airliner. The map below details the 9/11 planes' flightpaths and some of the military bases in those areas. The flights went through some of the most heavily militarized parts of the country. The above map shows that all of the hijacked planes transponders were turned off during their flights. This does not hide the plane as it can still be tracked by skin paint, but it hides the plane's altitude and it should immediately call attention to the aircraft. 8:45 a.m. - United Airlines Flight 175 is taken over by five hijackers who use knives, Mace and the threat of a bomb. Both pilots are killed and the plane is diverted southward to New York City. Flight 11 had crashed into World Trade Center 1, and Flight 175 was hijacked and heading toward New York. Fighter jets were ordered to stay in a holding pattern off Long Island. Why weren't they ordered to protect New York? ...so it stands to reason that other planes reported seeing Flight 93 during its flight, therefore the military could have easily located the plane. 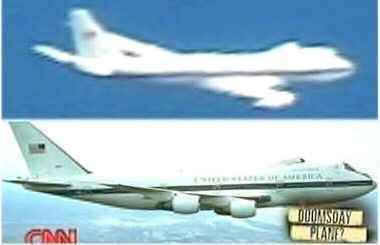 That being said, why didn't the FAA and military locate of all of the hijacked aircraft through planes which were known to be in their vicinities? At least six air traffic controllers who dealt with two of the hijacked airliners on Sept. 11, 2001, made a tape recording that day describing the events, but the tape was destroyed by a supervisor without anyone making a transcript or even listening to it, the Transportation Department said today. "Be careful what we say on the loop, because these are being recorded and these tapes will be handed over." This page from the Andrews AFB web site (removed 9/12) shows the base had F-16 fighter jets which could have intercepted Flight 77. Instead, F-16s were scrambled from Langley AFB which is 120 miles south of the Pentagon at 9:30 a.m.
Why didn't the E-4B order the fighters to defend Washington? 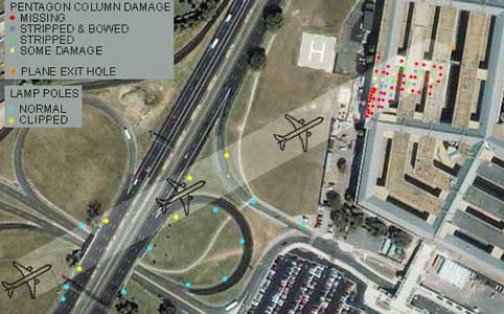 The plane was flown with incredible precision by a pilot who could barely fly a Cessna, and it hit the newly renovated Pentagon wedge. Question: How was a plane which was known to be hostile able to have an unimpeded 48 minute joyride around US airspace before slamming into the heart of the US military?